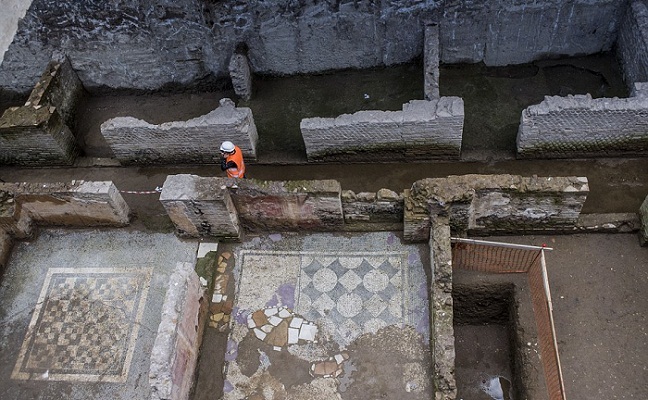 Archaeologists say work to expand Rome's subway has unearthed a sprawling 2nd-century domus, or residence, of a military commander, complete with well-preserved geometric design mosaic, marble floors and frescoed walls. He says the subway work has turned into an "astounding archaeological construction site." The domus, found 12 meters (40 feet) below the surface, includes at least 14 rooms and a fountain in a central courtyard. The ruins will be moved elsewhere so tunneling can continue. Work to build new stops on Rome's Metro C line is running years behind schedule. Interruptions to excavate ancient ruins explain some of the setbacks. Bureaucracy and construction scandals have also caused long delays.